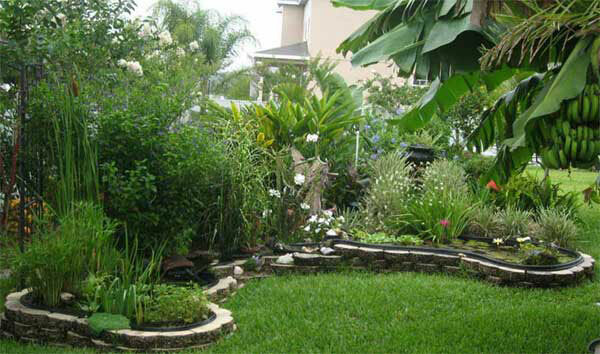 A water garden can be as small or as big as room permits. Decide on a sunny location and the size of your pond. The one pictured here is made of preformed elements: two basins, a waterfall and 3 small basins to connect the two ponds. 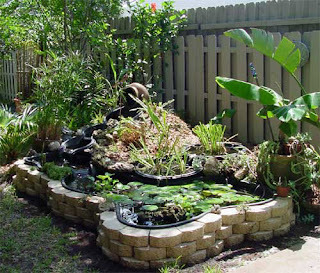 To add a small waterfall is simple to achieve by piling up the dirt that was dug up for the pond basin. All you need is a small pump you can get at any shop that sells the pond articles. Underwater lights on a timer make the water garden enjoyable in the evenings, and help in the colder months here in Central Florida to keep the water temperature a few degrees warmer, just enough to be beneficial to fish and plants. Ponds are not swimming pools, you do not need a filter system! The most important one, a small waterway with rocks added. The waterfall basin is fine, and/or the waterway connecting two pond basins. What happens is, the moving water collects oxygen, algae starts growing in the waterway and cleans the water by feeding on the natural nutrients. Plants feed on the nutrients and snails feed on decaying plant material. A harmonic circle of nature with no need to interfere. But be patient, at first the water will change to look like pea soup. That is perfectly normal, and after a few weeks the water will clear up and will stay clear. Decide on the layout, how to position the basin and the waterfall. As you can see on the pictures, we have used stones to raise the basin a little above ground. Our first couple of ponds were ground level, but small ponds can easily end up looking like sinkholes. You will need fish of course. Koi are great, but expensive and they will grow to be large. Goldfish are fun and affordable. Take into consideration the Florida wildlife, including the neighbor's cat. Those animals may think of your pond as the local sushi bar. I have frogs around my pond and it seems they like to eat fish. One easy solution is to buy feeder fish at the pet store. Since I added two dozen minnows I never lost a goldfish and the minnows multiply, but still do not get out of hand. Minnows are fun to watch, they swim as a 'school'. Scum suckers ( Plecostomus) are cold sensitive and have to be brought in over the Central Florida Wintertime. Be warned, they can become quite large and with their spiny backs and long whiskers look pretty scary. Snails, trap door and trumpets, are good to have. The apple snails look awesome but they are so very hungry and will eat your water lilies down to the dirt level. Same with water turtles, they love the new shoots of your aquatic plants. Do not add crawfish, my kids caught some and we thought it nice to have them in the pond. Not! they fattened up on the goldfish fast. You will get lots of visitors: all kinds of birds, butterflies, dragonflies, frogs, lizards, and some weird ones, too. Plants for your water garden are many to choose from. There are night blooming water lilies and day blooming ones, in all kinds of colors and prices available. Water hyacinths and water lettuce multiply fast and need to be pulled out regularly to end up on the compost. NEVER 'release' them in the wild! Water iris are a reliable flower, I have two kinds, the Louisiana iris and a black iris, flowering in spring time, one earlier than the other. Other swamp plants are for example Star grass, water clover (Marsilea mutica), pitcher plant, dwarf cattail, dwarf umbrella plant, Floating heart ( Nymphoides peltata). You will also need Underwater plants, like Anacharis. Fish love to swim through this plant, and it of course produces oxygen. 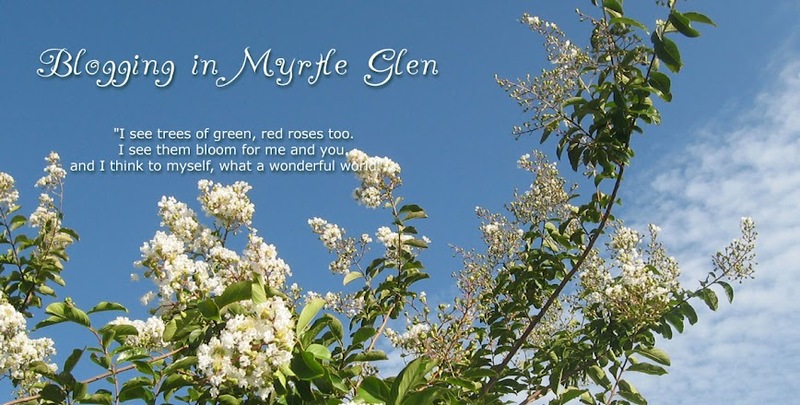 Buy them online, at a local store or ask a friend owning a pond to share plants. Place the newly planted water lily on a couple of bricks so the pot is submerged and the leaves are just a little below the water surface. Sink the pot deeper by taking out a brick as soon as the leaves float on the water. Keep taking out the bricks over the next few days until the pot sits at the bottom of the pond. Add some interest underwater with a broken clay pot, big stones or conch shells with holes. The fish like to hide, explore and play catch with each other . Yes, some maintenance is necessary. This is especially important for water lilies, feed them and they will bloom nonstop. Fertilizer tablets are available to be pushed into the sunken pots. Feed fish in the colder months. During mosquito season there will be enough for the fish to eat, I feed my fish a little every day, but realized quickly that in the colder months they come up and eat the pellets greedily, while during summer they take a look at it and swim away. Buy pellets, not flakes. General rule, use the amount of pellets that the fish will eat in 5 minutes, net the leftovers out of the water and discard. Food that sinks to the ground will reduce water quality. This for me isn't really a chore, I visit my pond at least once a day and while enjoying the water garden I pick a dead leaf here and there, and pull out some of the floating plants (for the compost). You want to have about 80% of the water surface covered by floating plants and/or water lily pads. When the water isn't flowing but just trickles, the pump grate is clogged up. How often this will happen depends on the debris around the pump. This chore is done quickly, just pull up the pump, shake off the snails and clean the grate and pad.